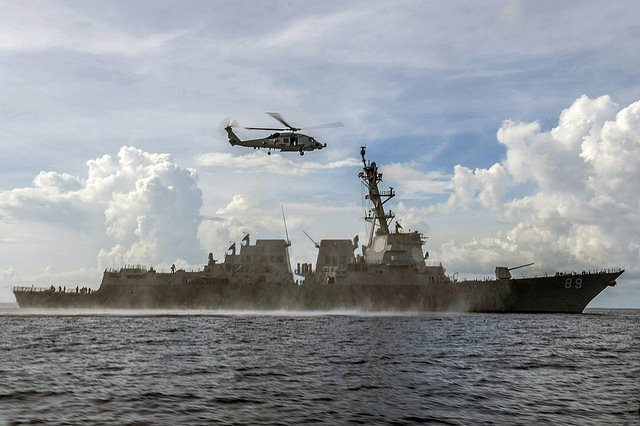 Last week’s revelation that the Pentagon had been briefing Asian allies  that US Navy warships would soon conduct freedom of navigation patrols in the South China Sea has ramped up tensions in the world’s most hotly contested body of water. Expected to take place within the next few days, the patrols would see US naval ships come within 12 nautical miles of at least one of China’s controversial features in the South China Sea for the first time since 2012. China has responded  to the news about the impending patrols by stating that it will ‘not permit any country to infringe on China’s territorial waters and airspace in the Spratly Islands in the name of ‘protecting freedom of navigation and overflight.’ However on Tuesday, US Secretary of Defense, Ash Carter, reinforced the US’s more muscular stance  in the region, declaring  that the US ‘will fly, sail, and operate wherever international law allows, as we do around the world, and the South China Sea is not and will not be an exception’. Indeed, the South China Sea shouldn’t be an exception. Freedom of navigation patrols in the South China Sea are perfectly legal under the United Nations Convention on the Law of the Sea (UNCLOS). They‘re seen by America and some of its partners as increasingly necessary to send a strong signal to Beijing that the US—and by extension the rest of the region—won’t accept China’s unilateral claims to the Sea, its belligerent enforcement of its claims, nor its militarisation of the islands. But US freedom of navigation patrols accompanied by tougher and tougher rhetoric puts Beijing between a rock and hard place. If the US does conduct the patrols, Beijing will be forced to chart a rocky course between a measured response that doesn’t escalate dangerous tensions between the two powers, and a response that doesn’t appear weak to China’s increasingly nationalistic populace. The influence of popular nationalism on the Chinese leadership should certainly make the US pause to examine the consequences of its ramped-up rhetoric surrounding the South China Sea. The CCP has relied on the twin pillars of economic growth and nationalism to consolidate its domestic legitimacy since 1989, fuelled by the careful construction of a widespread patriotic education campaign . The CCP has actively promoted a nationalist discourse that juxtaposes China’s long and proud history of civilisation with its shameful experiences at the hands of colonial powers during the Century of Humiliation . On top of this, the CCP strongly emphasises the Party’s role in China’s economic successes and national rejuvenation over the last 30 years, successfully positioning itself as the upholder of Chinese territorial integrity, defender of Chinese sovereignty and champion of China’s core interests. With Chinese citizens increasingly nationalistic over the South China Sea , any ‘tough’ US action in the region is likely to cause a strong backlash in China. In the face of slowing economic growth, or China’s ‘new normal ’, the CCP can’t afford to be seen as weak in the face of any perceived US disrespect to its territorial sovereignty. This may lead the CCP to adopt a hard-line response in an effort to placate outrage back home. This wouldn’t be the first time the Chinese leadership have altered their original measured responses to similar incidents in an effort to soothe domestic sentiments. The 2001 US EP-3 spy plane incident , the 2010 Senkaku/Diaoyu  raw earth minerals incident and the escalated tensions in 2012 around the Senkaku/Diaoyu islands all spring to mind. Despite the ongoing game of chicken in the South China Sea , an escalated response to the US patrols certainly isn’t in China’s strategic interests, even if it shores up legitimacy at home. Nicholas Kristof’s old adage  that nationalism is a ‘particularly interesting force in China given its potential not just for conferring legitimacy on the government but also for taking it away ’ is pertinent. It’s been argued elsewhere  that assertive  US efforts won’t solve the South China Sea challenge. That’s right—all provocative language from the US will do is fuel domestic tensions in China that the CCP will be unable to ignore. This isn’t to say that the US should halt its proposed freedom of navigation exercises. The US should by all means conduct the patrols, but should wind back the language and stick to highlighting the patrols as ‘routine’ and in-step with international maritime law. The US should also restrict their patrols to features that were indisputably only submerged bodies before China’s massive land reclamation activities , such as the Mischief Reef, to avoid further escalating Chinese tensions around territorial sovereignty. These steps would go a long way in taking some, but certainly not all, of the heat out of South China Sea tensions and avoid backing Beijing in to a situation that’s in neither Beijing’s nor Washington’s interests. Mercedes Page is a research intern at ASPI. Image courtesy of Flickr user U.S. Pacific Command.